Chennai’s real estate landscape continued to expand with the same momentum from Oct-Dec 2014 to Jan-Mar 2015, clocking an average growth of five per cent. This can be attributed to rapid growth in infrastructure that translated into excellent connectivity city-wide. Properties in Central Chennai registered the highest surge in capital values by almost eight per cent. South Chennai followed lead with over six per cent. The west and north regions of the city witnessed growth by four per cent each. South Chennai witnessed 50 per cent of the city’s residential developments, stated a JLL report. This trend was reflected in the list of top performing localities of Jan-Mar 2015, wherein six out of 10 areas – Saidapet, Pallavaram, Thoraipakkam, West Mambalam, Selaiyur and Navalur were from the South. Prices of properties in proximity to the upcoming metro corridor are expected to rise by 15-20 per cent after it gets fully operational. Introduction of Real Estate Investment Trusts (REITs) also propelled growth in Chennai’s real estate market, since it promises to infuse professionalism in the sector. Chennai witnessed a shift in preference of homebuyers from medium-sized (750 sq ft-1200 sq ft) and large-sized (1200 sq ft or more) properties to smaller houses measuring 750 sq ft or less. The new growth corridors in the city extend from Madhya Kailas to Sholinganallur. This 12 km stretch is being developed as South Chennai extension, featuring flats at a more attractive price than Adyar and Thiruvanmiyur. The city is also seeing footfall from High Net-Worth Individuals (HNIs), especially in Nungambakkam of Central Chennai, which credits its 16 per cent rise in property prices to this factor. 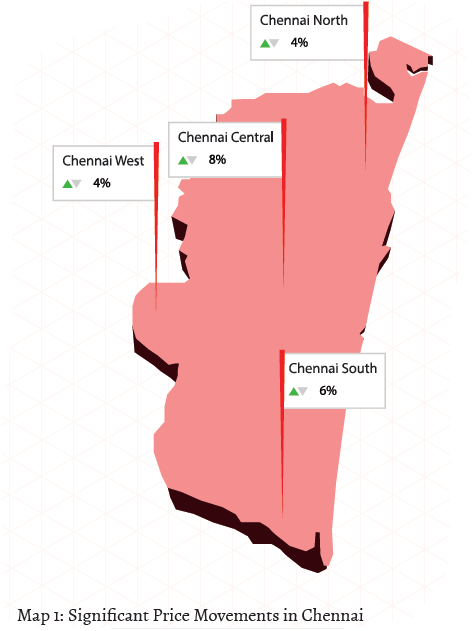 Saidapet in South Chennai was the highest gainer with 25 per cent surge in property prices in Jan-Mar 2015. A highly populated area, prices in Saidapet spiraled on the promise of excellent connectivity since the metro line connecting Washermanpet to this locality is being developed. Capital values in Kolapakkam and Arcot Road in West Chennai are riding on road infrastructure. While Kolapakkam witnessed some new roads being laid, Arcot Road benefitted immensely from the newly-constructed flyover, the lack of which created a mayhem in the locality even during the non-peak hours. The 200 ft radial road connecting Thoriapakkam with Pallavaram has become attractive to residential investors due to its strategic location between the Old Mahabalipuram Road (OMR) and NH-45. Excellent rail-road-airport connectivity and presence of healthcare facilities, shopping centers and educational institutes has heightened the localities’ growth potential. Properties in West Mambalam recorded a massive spike of 18 per cent in Jan-Mar 2015 due to heightened security measures in the form of installation of CCTV cameras in few of the streets and increase in the number of police booths. Capital values in Selaiyur and Navalur appreciated due to the presence of IT companies, proximity to the Grand Southern Trunk Road (GST Road) or NH-45, thus guaranteeing good connectivity with the rest of the city. Rental values increased by an average of 12 per cent in Jan-Mar 2015, as compared to Jan-Mar 2014. Interestingly, all the localities which recorded the maximum rise in rental rates were located in South Chennai, with Sholinganallur being the frontrunner with over 30 per cent increase. 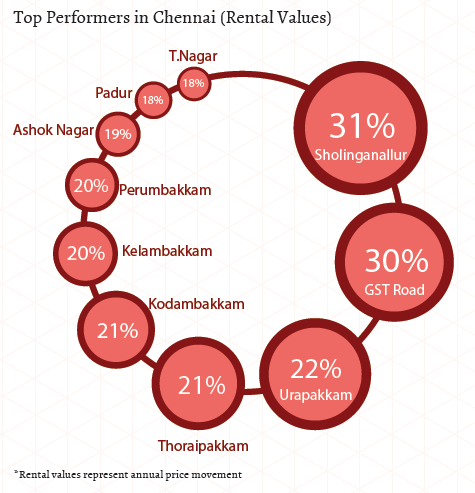 South Chennai witnessed the highest rise in rental rates by 13 per cent, followed by West Chennai which recorded 11 per cent spike. Rentals in the northern region rose by almost eight per cent while that in the central region increased by three per cent. Demand for rented apartments in Sholinganallur and Thoraipakkam (21 per cent) is riding on the presence of IT-ITES majors, which attract workforces from all across the country. Sholinganallur also houses engineering colleges. In addition, the bridge which was being constructed on the Kalaignar-Karunanidhi Road, connecting the East Coast Road (ECR) with OMR at Sholinganallur was finally completed in February, leading to a further growth in popularity of the locality. Another locality which owes its popularity to road infrastructure is Kodambakkam which clocked 17 per cent rise in rental values. This is a posh area witnessing rapid development in terms of flyovers and roads. The redevelopment of the Kodambakkam Bridge reduced traffic snarls while the new flyovers around the locality eased traffic flow to the neighbouring areas of Ashok Nagar, K.K. Nagar and Nungambakkam. The growing IT industry triggered the trend of society living in Chennai. Owing to this, the city saw maximum demand for residential apartments. However, independent houses still remain a preferred choice for the city’s local residents. While residential apartments continued to be the most popular choice, hence, available property type in the city, its supply dropped by five per cent in Jan-Mar 2015. From making 72 per cent of the total market share in Oct-Dec 2014, apartments made up about 67 per cent of the market share in Jan-Mar 2015. After Hyderabad, Chennai continued to remain the only city which recorded almost one fourth of its total supply of housing units as independent houses/villas. The supply for these units has been in line with demand since more Chennaites still prefer independent living. 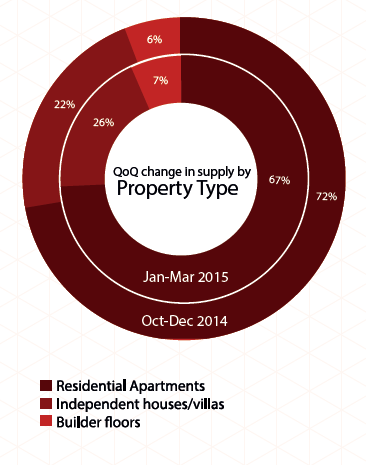 In Jan-Mar 2015, independent houses/villas recorded 26 per cent supply, four per cent higher than the previous quarter. Supply for builder floors continued to be the least in the city (seven per cent). However, their availability went up slightly in the last three months. On a quarter-on-quarter analysis of supply of various budget ranges, it was revealed that Chennai saw a slight decrease in supply of lower ranged properties, whereas, supply of higher ticket sizes went up in this time frame. The affordable housing category of within Rs 25 lakh and the mid-income housing category of Rs 25-40 lakh, together made up about 37 per cent of the total market share, three per cent lower than the previous quarter when it made up 40 per cent of the market. On the other hand, the luxury housing category of Rs 60 lakh – Rs 1 crore and the ultra luxury housing category of Rs 1-5 crore also together made up 37 per cent of the market share, but three per cent higher than the previous quarter. 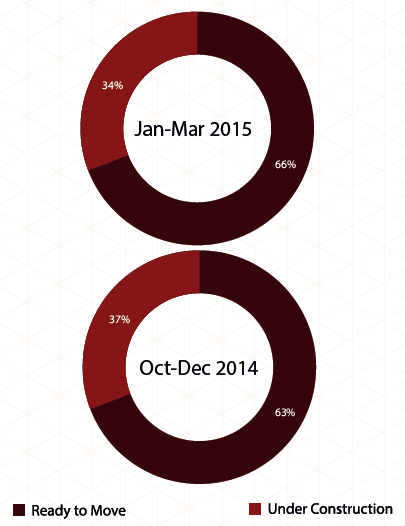 The two categories comprised of close to 34 per cent of the market share in Oct-Dec 2014. If looked at individual distribution of various budget ranges, the mid-income housing category (Rs 25-40 lakh) and the high-income category (Rs 40-60 lakh) saw the maximum supply in the city. Both the categories made up almost one fourth of the total market share, each. 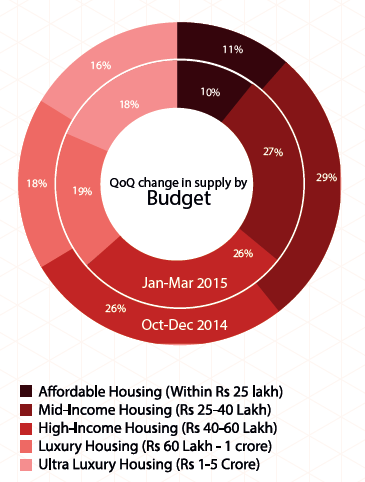 Supply of the budget category Rs 25-40 lakh (mid-income housing) dropped by about two per cent in the current quarter. The number of units being constructed in this budget dropped by five per cent, indicating few new launches in this category. Given the increasing amount of migratory population residing in the city, demand for mid-sized has been inching up steadily here. Suiting the needs of both size and budget, 2BHK units continued to remain the most popular choice amongst both buyers and sellers. Its supply stood at 60 per cent in Jan-Mar 2015, two per cent higher than Oct-Dec 2014. Close to 65 per cent of the 2BHK units were available in the ready-to-move-in state, with the rest still being under-construction. Slightly larger homes configured as 3BHK units were the next most supplied in Chennai and made up almost one fourth of the total inventory. Its supply inched down insignificantly in the current quarter. 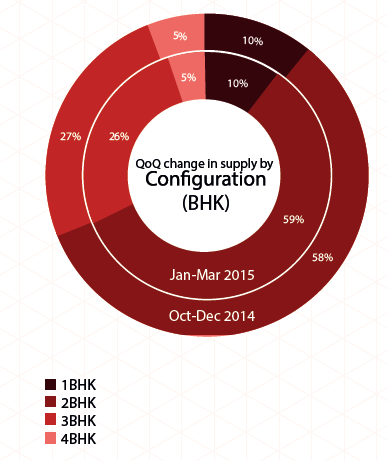 Availability of both 1BHK units and 4BHK units remained stagnant in the last three months. Large sized 4BHK units continued to be the least supplied in the city due to less takers owing to a higher ticket size. Close to 70 per cent of these units in Chennai were available as ready-to-move-in. The city recorded an increased supply of ready-to-move-in properties. Overall, supply of these units went up by three per cent and stood at 66 per cent, as compared to 63 per cent in the previous quarter. Supply of under-construction properties dropped to 34 per cent this quarter, from 37 per cent, indicating slow rate of new launches in the city and delivery of several ongoing projects. Out of the total under-construction properties, maximum (30-31 per cent each) were offered in the budget range Rs 25-40 lakh (mid-income housing), closely followed by Rs 40-60 (high-income housing) category. In terms of property configuration, 2BHK units made the maximum share of the total under-construction properties. Close to 60 per cent of the total homes being constructed in Chennai were configured as 2BHK. Units configured as 3BHK were the next most constructed in the city. The category made 26 per cent of the total under-construction properties. Larger homes of 4BHK configuration were the least popular amongst developers and thus, made up only four per cent of the total under-construction properties. *Rental Values represent annual change.